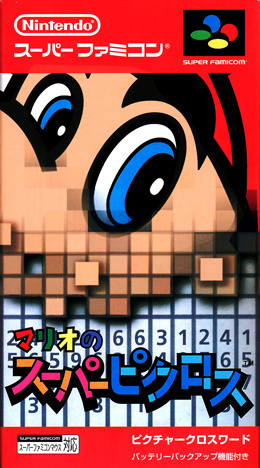 Each Picross puzzle consists of a grid of tiles which reveal a picture when solved correctly. 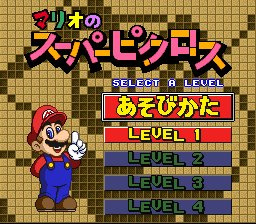 In Mario's main game mode, a wrong move means losing precious time. However, in the more difficult Wario puzzles, mistakes are not indicated and the timer counts upwards! 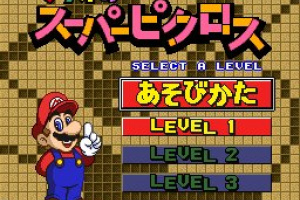 Like Picross DS, Mario's Super Picross also features a save ability that lets you return to a puzzle later, and various background melodies. Hold on, wasn't this JP only? Either way, I love Picross DS, so I'm certainly not saying no to more of the same! Finally! I love Mario's Picross on the GB. Yes finally some games from Nintendo that were never Realeased outside of Japan, and I love Picross! Still, I'll be considering it. I have never been more confused and scared by a game. Maybe it's because it's in Japanese (Which I can't read), but just how the bloody hell are you supposed to know what you're drawing? It doesn't look like it gives you hints or anything. And it can't even be themed, because one of them before the Footie player is an Aubergine (SP). You're not supposed to know what you're drawing (Not until you're done or near done anyway). Picross is about uncovering a picture, not recreating a picture. 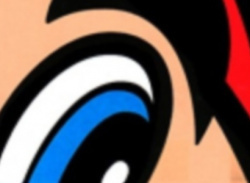 You can buy hints in exchange for time, though not in Wario mode. So if you aren't supposed to know what you're drawing, what makes it fun? I mean why would hacking/chipping away at a bunch of tiles for hour after hour trying to create a picture in the hopes it's the one that the game wants you to do, be fun? Demon, look at all the numbers around the board. By those numbers you can figure out where to start "chipping away". The numbers are supposed to help? I'd have thought one of them saying "64" when there aren't 64 tiles in a column to be unhelpful, rather than helpful. 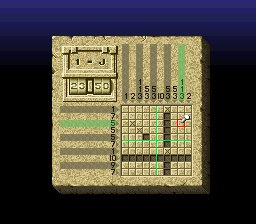 So basically this is a glorified costly version of Minesweeper but with pictures? There's a space between 6 and 4. Read the review. Don't rise to the bait Drake, I guess some things are just lost on certain people. DEMON212's just going to have to wait a couple more weeks for Super Metroid. This is a great game, and it's wonderful to get a chance to play it. Note that, to add to the excellence, as it was never released in PAL before and hence crushed/slowed down/ruined it runs fullscreen and at 60HZ. Hey, why is there only the first line of my previous comment? Was the rest I wrote so unfitting? Just downloaded this, and yeah I love it. 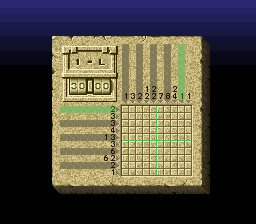 It's just the successor to Mario's Picross for Super Game Boy. Remixed music and all new levels, everything colored and animated, full screen at 60hz. 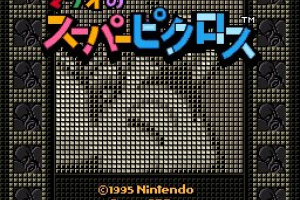 Anyway, it's odd that much of the screentext is in Japanese but that won't hold off Picross fans. There is no story or anything that's much of interest. You have to understand the concept of the game, and it's simple and that's all. Everything that could be of importance is written down in English (like the manual). Many many puzzles await, Nintendo characters like Wario appear, and it's one of the best puzzle games out there. An absolute classic. I was always hoping it would appear ever since Japan got it last December, and I'm glad to see some of the classic ditties from GB version is in this game. 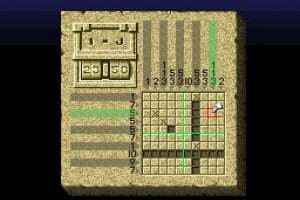 One of the best puzzle games around and in many ways, it's much better playing Picross on the telly than the handheld... this is especially true with the larger puzzles where scrolling spoiled the experience somewhat in Picross DS. Puzzle fans should grab this now. It really is a truly awesome experience. The official website says this game can only be played using either the classic controller or the gamecube controller. Is it maybe possible to play this game with the wii-remote? 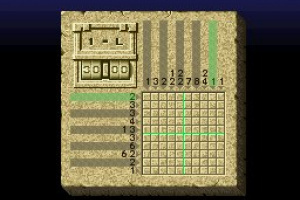 I would think you don't need more than 2 buttons for this kind of game (my experience with Picross DS). Translating it would have cost a lot more points. Every Picross game is worth picking up, even if you already have others. This is definitely worth the points. 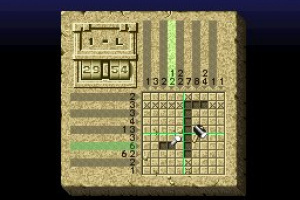 Every Picross game has different puzzles. The language it's not vital for it's addictive gameplay (you won't notice that minutes becomes hours.). Hope this comes to US pretty soon. What's the chance of this coming to the US? Why hasn't this game come to the States yet!? I need to satisfy my Picross fix! Yeah, I would totally love if this game were released in NA please? It needs no translation & it's great . It's a smart game for smart people . This is the game I got the most excited about on the VC. For me, there was no descision to be made about its purchase, it IS a must have. If I had to spend eternity with only 3 games, I would have this, Street Fighter 2 Turbo, & Paper Mario: Thousand Year Door. Easy. Dang it! I really want this game to come out here in America, but as usual we have to wait forever to get it!!!!!!!!!!!!!!!!!!!!!!!!!!!!! Why must NOA deprive us of this good game. i hav picross ds and i really enjoy it. i hope this game cums out in the us. i luv picross. I'd love for this to come to Northa America, It looks like a real addictive puzzler. By the way, how do you pronounce "Picross"? Is it PIE-cross or PIH-cross? Pee-cross or Pih-cross I say it as. i wish this game comes out 4 NA VC. i luv picross ds and mario's super picross. 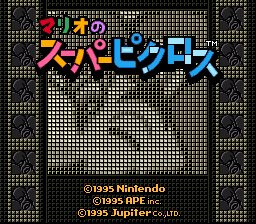 It was for original Gameboy was it not Jona? I think I'm going to have to skip this. 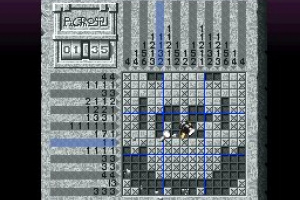 I love Picross DS, so its a bummer we American gamers have yet to get this. sigh...oh well, I am sure it will get here eventually. Probably around europe's next hanabi festival. 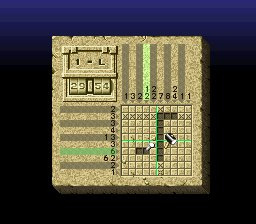 Now that I've played Picross DS for the first time and love it, I want Super Picross! I hope this comes to the U.S. soon! Even if the title and selections are still in Japanese, I don't care! 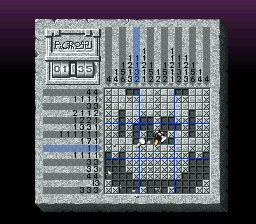 Just bring that Picross action! I doubt it will ever come to the US, the same goes for Skate or Die. @47 Yeah I don't see this coming now either. Its been too long. Never say never. Yeah it has been a long time, but Vectorman took over a year to finally come to NA. This game will eventually see a Virtual Console release, just be patience. I've all but given up on this coming to the NA.